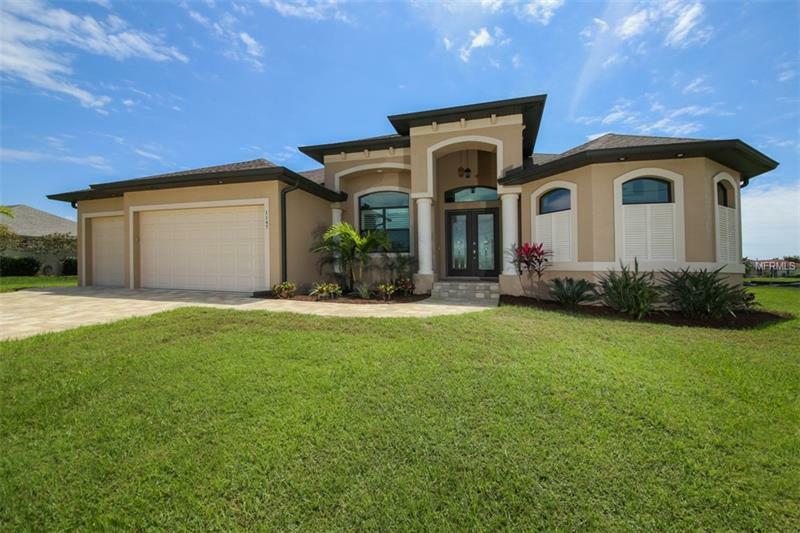 SIMPLY IRRESISTIBLE custom built home with a 3 car garage on 2 tastefully landscaped lots in the newer Pine Valley section of the Rotonda West golfing community. This home provides immediate curbside appeal with tasteful landscaping, a nice lawn and a wide paver driveway / walkway leading to elegant double front doors. Once inside, youâll notice the double coffered ceiling with rope lighting, upscale base and crown molding, beautiful porcelain tile flooring in every room, and a professionally decorated interior. This home has a chef-worthy kitchen offering plenty of work and storage space, high-end appliances and cabinetry coupled with gorgeous granite countertops. The master suite is luxuriously appointed with 2 large walk-in closets and a roomy master bath with dual sinks and a Roman style walk-in shower tiled to the ceiling. Windows and doors have impact glass engineered for up to 160 mph winds- no storm panels required! Step outside to the large screened lanai with pavers, and youâll notice a beautiful pool equipped with spa jets that can be adjusted to maximum comfort while you watch the stunning sunsets over the Rotonda River. This lanai also has roughed in plumbing for a Florida Kitchen. Ten yrs parts & labor warranty provided on the A/C system (expires 3/1/26). This home is perfect for entertaining, inside or out. Ideally situated, it is located close to beautiful beaches, boating, golf courses, shops & restaurants. Furniture negotiable. Schedule your private showing today.